At first I wanna say that I recieved lots of help by the community around terence_, so cannot say this thing was done by myself. Anyway, this is a very basic guide. This does not require anything, can be played SSF and/or as starter. Currently I am mapping alched/vaaled T12-T14 maps, sometimes T15. I can run all of them without any issues. For the second GIF I changed my ES belt for a (freshly found) Bisco's Leash, just to see the progress. Maps are T12 (first gif) and T14 (second gif) by the way. It was the first time running that map, as you can see on my clearing way^^. If you got any question you can hit me up in here or ingame. - Requires you to use skills and flasks frequently to make use of all the potential. Not everyones style. - You need to stop for casting Soulrend or any other skill. My main goal is to improve this, so let me know if you found something I can do better or whatever :) If someone says you shouldn't do this he/she is probably right. Appreciating any advice! With this build I am running any kind of map mods. Currently I mainly run alched and vaaled t12-14 shaper/elder maps. I am sure this build can run t16 maps as well, just did not try it yet. Same for late late game content. 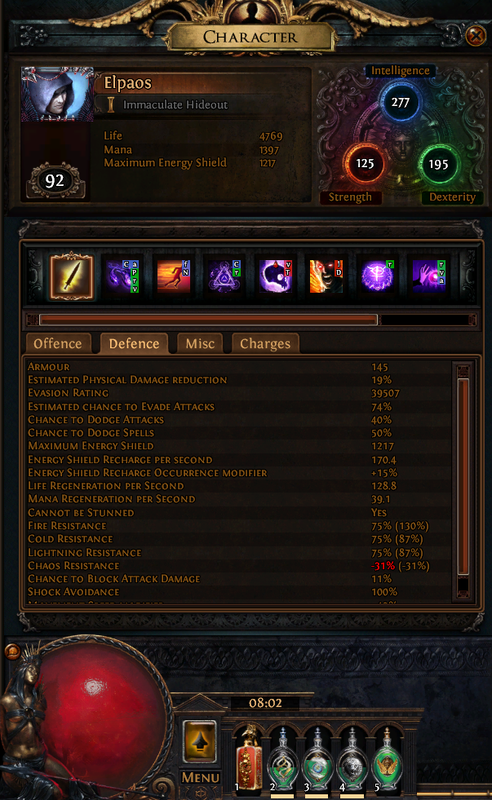 This build was running with mostly SSF gear before. Just improve your quality on gems and flasks. Additionally you can use Blight Totem to deal additional damage and slow down the enemy. You can change the tree like whatever you want to. I was using the minion nodes before I switched to acrobatic, but this way this is way less squishy and the damage is still GG. Same for the skills and gems. I am using only one HP flask and 4 utility flasks. Flasks are more useful than any item upgrade you can get. When you have increased duration as suffix you'll be able to keep them running permanently. The gear was (except the 6l) pretty cheap. I paid around 5-10c for any item you can see below. 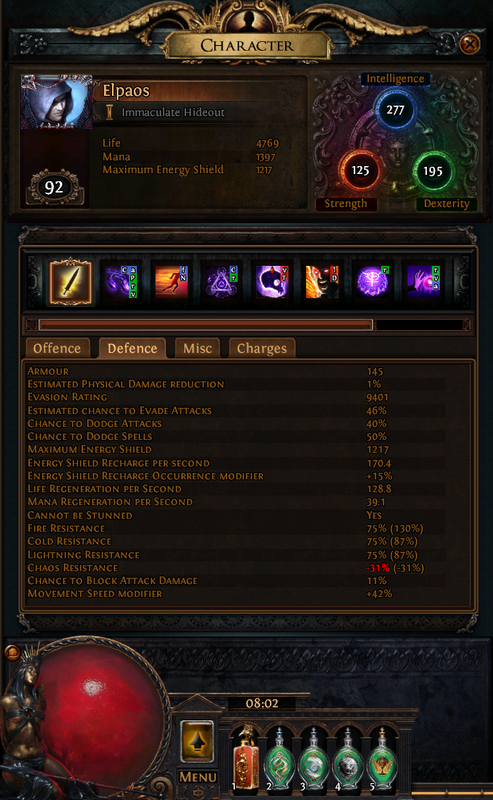 Just have a look for high evasion on the armor and high ES on the helm. You can use any unique armor with higher evasion, e.g. Queen of the Forest or Hyrri's Ire. Spreading Rot, to achieve Wither when casting Blight. Intuitive Leap to skill "Overcharge" node. A jewel with res/attributes/dot/life, depending on whatever you need. This will not trigger Phase Run, but all skills will use the Increased Duration Support gem. Arcane Surge will not work because of EB. I mainly use utility flasks. I am able to keep them up permanently when I am mapping because of the increased duration prefix + 20Q. You can use unique flasks but I'd highly recommend using utility flasks. Skills: Skills such as Frost Bomb, Explosive Traps, ED + Contagion, Bane later on will work until you got Soulrend + GMP. Do you use your Bane for DMG or only to apply the despair curse? For the despair curse you could craft something like this with an abberant fossil. I needed 10 fossils for this wand. This way would get 4 gemslot that you can use for aura gems. A vaal grace and malevolence would buff your defence and offence. I'm trying this setup on PS4... CWTD is casting Phase Run! This was a dumb statement. When you said, "Intuitive Leap to skill the "Overcharge" node" did you mean Overcharged? 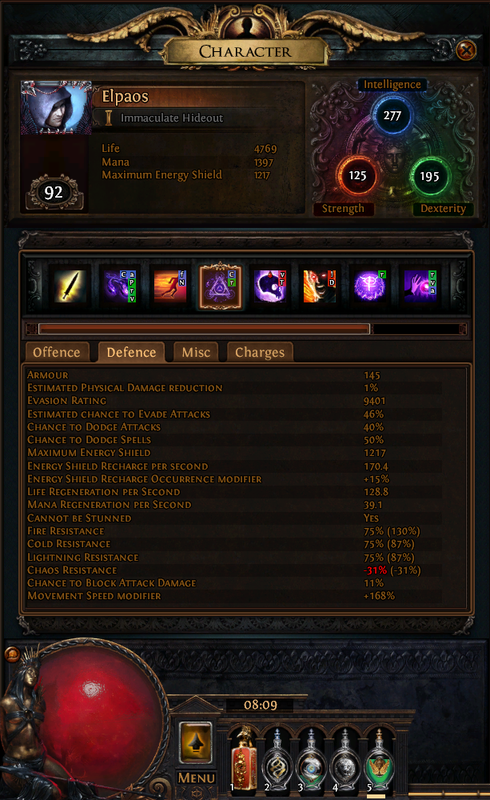 Overcharged: 8% Chance to get a Frenzy, Power or Endurance Charge on Kill. So far I'm enjoying this build, thank you for posting.